Olly Taylor is a 19-year-old footballer, who is currently without a club as he recovers from knee surgery having formerly been at Wycombe Wanderers where he came through the youth system. He tells us about his time at Wycombe and what it’s like for a footballer to get knocked back so early on in their career. Olly kindly gave his time to give us an insight into what it’s like for a young footballer fighting his way to the top. Give us a brief outline of your football history, first club up until now. Well obviously I started playing in the Sunday leagues from a young age and joined Wycombe Wanderers at the age of ten. I signed my pro deal at 18 and stayed at Wycombe until the end of season 2012/2013 where we decided to part ways. I’ve currently just gone under knee surgery and will hopefully be back playing by Christmas/New years in League 2 again. You’ve had an experience of working day to day in a professional football club, what was it like for you, describe your experience? My experience working day to day was a very good one. I made sure I was always one of the first through the door for training and always the last to leave. But to be honest, that doesn’t really matter. You can work as hard as you want but if the manager has a set team in his head he’ll always go for that no matter how hard you work. I worked as hard as I possibly could, I think that’s why I was frustrated for a lot of the season as I would see other players who didn’t want it as much as me play. When did you decide you wanted to be a footballer? I never really decided I wanted to be a footballer, I just started playing and I was good at it and everything else fell around it. If I had to put a time on it I would probably say around the time I knew I could make a living out of the sport. For those that don’t know you well, you struggled to get a real opportunity to show your talent at Wycombe, what’s it like to get knocked back and how do you pick yourself up again? It is very hard to get knocked back. I think it came as a shock to me because I’d gone through every single year knowing I’d get picked or play and then when the important year comes round its not like that at all. To pick yourself up again I think you have to take a step back from it all and work out your next move, try not to get too emotional and always stay professional. 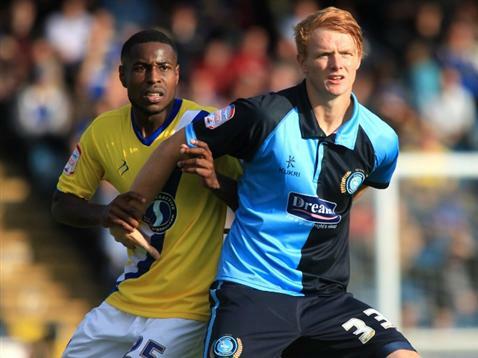 As a youth player, what roles did you have at Wycombe? Did you have mentors? Did you have extra jobs you had to do? I would have to collect the equipment after training and clean the changing rooms everyday. Others had to clean boots. That’s how I got my first chance with the first team was by doing my jobs the best I could. Which player has had the biggest impact on your career? I couldn’t put it down to one player as there have been a handful that have helped me along my way, some have helped me mentally and some have helped me physically, the more experienced players at the club are the biggest help. Which manager has had the biggest impact on your career? I would have to say Gary Waddock and Richard Dobson. Richard Dobson helped me develop into the player I am today and Gary Waddock gave me my first opportunity and both reserve and first team level. I owe a lot to them both and it’s a shame I wasn’t able to work with them for longer. As a footballer what sacrifices have you had to make? Were they worth it in your opinion? The main sacrifices I’ve had to make are saying no to going out with friends or having a strict diet and early nights. Nothing too serious. And yes they’ve been worth it, if I had a second chance I’d make the same decisions. Even at youth level there are things in your contract that restrict how you live your life, can you give us an idea of what sort of things you aren’t allowed to do? It’s basically things that would prevent me from getting injured so I can’t ski, ice skate ride a motorbike etc. At a youth level the contracts are very basic. Coming through the ranks at Wycombe, would you say the relationship between first team and youth team is a good one? Or would you say that they don’t treat you well? Some would be more friendly than others but on the whole everyone was friendly. As a youth team player I was told to be seen and not heard so I always kept in mind that you did have to be respectful to the first team. What sort of diet did you have to stick to as a footballer? My diet is strict but I do allow myself some treats. Its mainly protein for breakfast, lunch and dinner with a few post match carbs and a lot of supplements and water and no saturated fats. I would probably have to say Jordon Ibe. I played a few seasons at youth level with him before he moved to Liverpool, he’ll be very good when he’s older. I’ve had the pleasure of playing against some Premier league teams (at reserve level) so I would probably have to say John Terry. There were better players on the pitch but I didn’t come up against them, I spent the whole game in Terry’s pocket! Where do you aspire to be in 5 years time? I’ve always said I’d be dissapointed in myself if I didn’t make it to the championship at some point in my career so hopefully I’ll be somewhere towards that in 5 years. I remember at youth level we were playing QPR. I scored within the first 5 minutes and at half time we were winning 1-0. The manager at the time, during the half time team talk decided to tell the whole team that we weren’t good enough and despite us winning, 99% of us would be working on building sites because we wouldn’t make it as professionals. We went on to lose 5-1. And finally, what would be your advice for any young, aspiring footballer? I know it’s a horrible cliche but really work hard, practice every time you can, be confident, don’t let people bring you down and be happy, otherwise what’s the point in doing it! Is there any joy in Rio? Yann M’Vila to join Rubin Kazan?